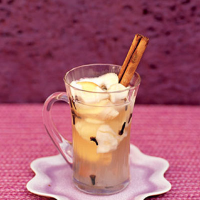 Divide the apple slices, ginger, cinnamon and cloves between four heatproof glasses. Divide the calvados and lemon juice between the glasses and top up with boiling water. Leave to steep for 5 minutes, add honey to sweeten, and serve.